Blog How to Soundproof Walls Using Green Glue Noiseproofing Compound! In this article, we will be talking about how to properly soundproof walls using green glue noiseproofing compound, also known as green glue soundproofing sealant. We use this product on most of our soundproofing jobs. 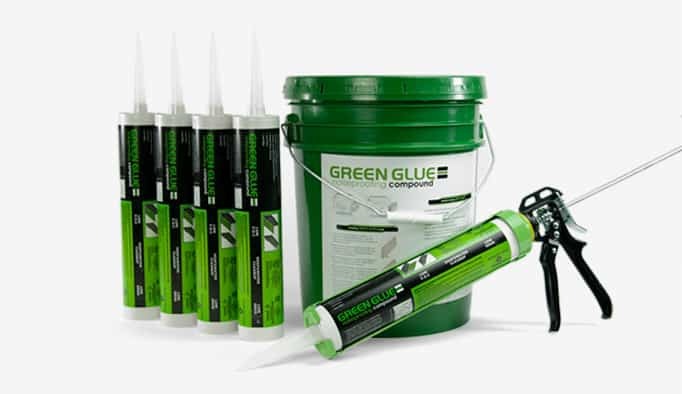 How is Green Glue Noiseproofing Sealant Different from silicon caulk or PL 400? How to Apply Green Glue Noiseproofing Compound. noiseproofing compound offers the best value for the money when it comes to acoustic compounds and sealants. If you correctly apply green glue by taking your time and paying attention to details, the results should be exactly what you would hope. 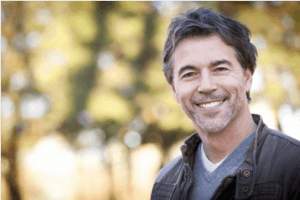 We’ve been able to to get up to 58 decibels worth of sound reduction between rooms after using the proper amount of green glue sealant, and we will show you how to apply green glue soundproofing sealant on your next soundproofing job! 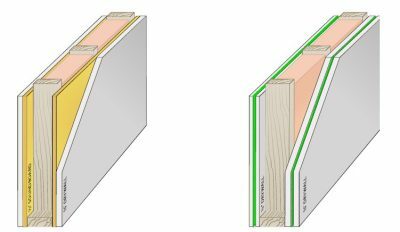 The basics of how Green Glue works is it’s meant to be used between two sheets of drywall. You place your first layer up on the wall, and then you caulk all the seams around it with Green Glue acoustic sealant. When you’re ready to put up your second layer of drywall, apply the acoustic green glue sealant onto the back of the second layer of drywall. You will need to use two tubes of acoustic green glue sealant per 4X8 sheet of drywall. After completing the green glue application, stand the second sheet of drywall against the first one and screw its down and that will squish the green glue between the two layers of drywall, and that’s what makes the green glue sealant do its job. Where to buy Green Glue? Green Glue also makes their very own soundproofing sealant. Im, sure many of you, are wondering how is green glue soundproofing sealant different from silicon caulk or PL 400. That’s a Good question because I was wondering that myself when I first heard of Green Glue. Unlike the standard silicon caulk, as green glue starts to set up, it firms up but will always stay flexible. It will not harden and crack over time as the standard silicon caulk would. The flexibility of the green glue allows it to absorb, reject and dissipate energy. That will keep it from going through the other side of the wall. When the first layer of 5X8 drywall vibrates from the noise coming from the other room, those vibrations then hits the coat of acoustic green glue sealant. You need to make sure to apply the recommended amount of green glue to assure that it works correctly. The vibrations are then stopped by heat generated from the green glue dampening compound. The green glue turns the vibrations into low levels of heat and doesn’t allow the sound to get through to the other side of the wall. 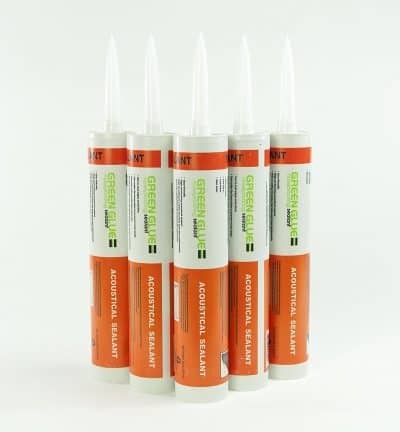 Click here for current Amazon Price on Green Glue Soundproofing Sealant. There are a few essential things you need to know when using green glue noiseproofing compound. Firstly, you can buy Green Glue compound in two different forms. Green glue comes in the form of court tubes for smaller jobs. The court tubes allow for clean and precise installation. You can also buy green glue soundproofing compound 5 gallon pails. The easiest way to apply the green glue when purchasing it in the form of a 5 gallon container is from a speed loader. The reason why someone would buy it in bucket form is that of the 25% of cost saving compared to the court tubes. It’s like anything else, you buy it in bulk, and you’ll save some money. You’re also left with a lot less garbage to throw out at the end of a job compared to using a dozen court tubes of green glue. Installing Drywall with Green Glue Noiseproofing Compound. 2 Sheets of drywall with Green Glue Noiseproofing compound. The method of installing drywall with acoustic green glue is a bit different because of the level of soundproofing you want to achieve. After the first layer of drywall is installed, the next thing you will have to do is caulk all the seams using acoustic sealant. When you’re caulking the seams with green glue noiseproofing sealant, make sure to push into the crack of the seams so the sealant is forced into it as far as it can. You can apply a heavy dose of sealant because you will be placing another layer of drywall over the first one. The soundproofing caulking is sealing off the air transfer and will provide some dampening as well. This soundproof caulking will not dry and crack over time. It will stay flexible for the life of the build and will not harden like a regular construction adhesive. While you have the second layer of drywall laying on the floor, it is time to put a right amount of green glue noiseproofing compound onto the back of the second sheet of drywall. Make sure to use two tubes per 5X8 sheets to achieve the expected soundproof results. If you are low on money and you can only afford one tube, you will meet approximately 70% of the desired soundproofing effect as two tubes would achieve. The Important thing to remember is to seal all the seams and outlets because even an eighth of an inch gap will negate most of the soundproofing effect by letting air and sound travel through the cracks. If you’re going to be using green glue soundproofing sealant, make sure to wear gloves. If you end up getting some of the green glue on your skin, wash it off with water immediately. It will wash off thoroughly with only water until it starts drying. After the sealant is dry, it gets difficult to wash it off your skin. 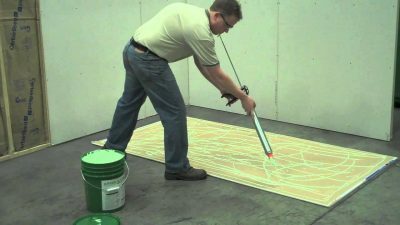 I hope you enjoyed our green glue acoustic sealant application tips. Let us know if you use green glue for your soundproofing jobs and how you like it. Have you had any negative issues with this product? Let us know in the comment section below!